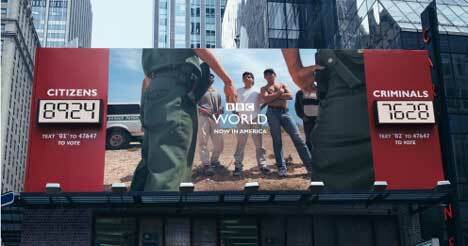 BBC World Channel set up a range of interactive billboards outlining different perspectives on world issues, promoting the channel’s launch in the United States. 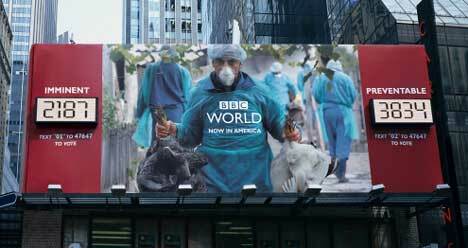 The billboards, erected in June 2006, invited New York pedestrians to vote on a range of world issues by texting 01 or 02. Bird Flu. Imminent or Preventable? Illegal Immigrants. Citizens or Criminals? 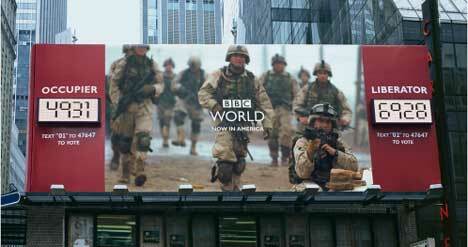 US soldiers in Iraq or Afghanistan? Occupiers or Liberators? China. Befriend or Beware? 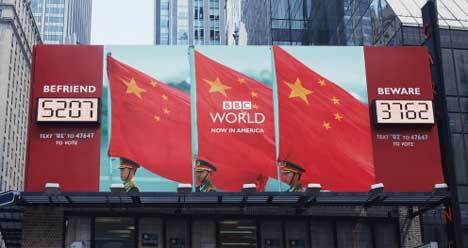 The BBC World Channel campaign was developed at BBDO, New York, by chief creative officers David Lubars and Bill Bruce, executive creative director Eric Silver, creative director/art director Jerome Marucci, creative director/copywriter Ari Weiss, copywriter Adam Kanzer, and art director Jamie Overkamp.